The M75, derived itself from the huge M44, was the ancestor of the M59, developed by the International Harvester Corporation (IHC), and long-derived from the M24 Chaffee T18 prototypes. It was platoon-sized, much smaller, with rear doors, and thickly armored to the front. In 1952 it was accepted into service and followed by a serie of 1729 vehicles, 700 being delivered by the Food Machinery and Chemical Corporation (FMCC). But it was also a complex and costly vehicle and lacked amphibious capabilities. Soon enough, FMCC company decided to produce its own experimental version, assuming it would be accepted by the Army. Already in 1951, engineers of the FMCC realized that a number of improvements could be applied to the model, and the team was asked to build a serie of amphibious, but simpler and cheaper vehicles. Several prototypes were tested and the best, the T59, was selected and type classified as the M59 in May 1953. Production was ordered in large numbers and stopped in 1960. 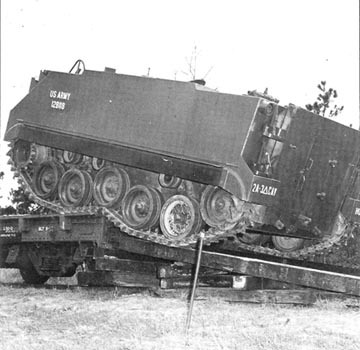 The vehicle had key advantages over the M75, it was cheaper due to the use of fewer components, less armor, and moreover, a pair of civilian truck engines, mounted on each side of the hull instead of an army-designed engine. It had also a lower profile and was amphibious. 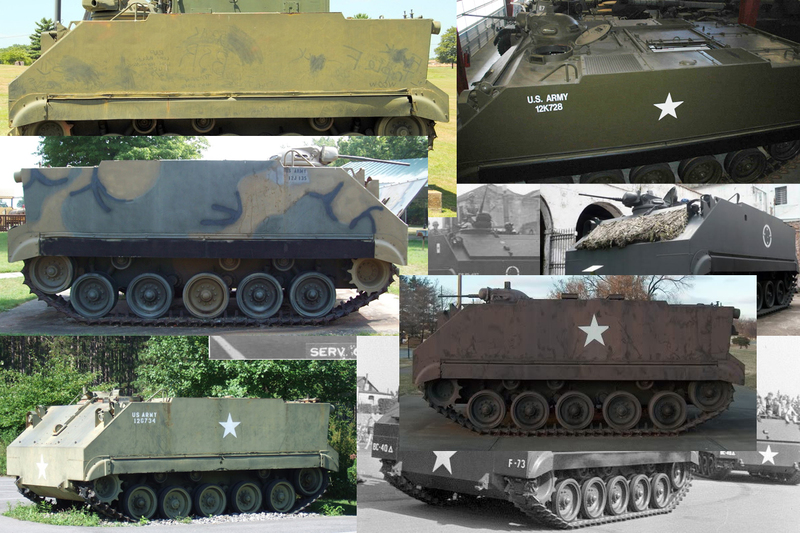 All these qualities were passed onto the next APC generation, known as the M113. The M59 had an RHA welded steel hull with an armor thickness of maximum 25 mm (half the M75) on the front blunt nose and glacis plate, to 0.625 in (16 mm) on the belly and elsewhere and 0.375 inches (0.95 cm) on top. The hull was slab-sided, longer, but much lower, and with a distinctive flat nose and slightly inclined rear plate. The roof was divided into three sections, but the interior was a single space. The front top section featured a driver’s hatch on the left and commander’s cupola to the right. The driver had an M19 infra-red night vision periscope and M17 periscopes for driving in a buttoned-up position, while the commander could receive an M13 cupola, with a .50 caliber machine gun, and 2,205 rounds in store. Behind them, the central space comprised two benches large enough for ten infantrymen, which can be folded up to make room for a standard artillery piece, a jeep, or various payloads. Access was made easier by a ramp equipped with an escape hatch. Four other hatches were provided on the roof. Side sponsons contained the vehicle’s drivetrain on either side. These were similar to the M75, but the last two roadwheels were further apart. The torsion bar suspension had shock absorbers on the first and last road wheel. The twin GMC Model 302 6-cylinder inline petrol engine, each developing 146 hp at 3600 rpm were connected to a single Hydramatic model 301MG transmission (or 300MG) with four forward speeds and one reverse. There was a controlled differential via steering levers. On flat, the top speed was about only 32 miles per hour, considerably less than the M75, with a 120 miles (150 km) autonomy provided by 135 gallons (511 liters) of petrol. To be amphibious, the vehicle was made tight by rubber seals on all hatches and doors, and a trim vane was provided for crossing. The maximum speed when swimming was of 4.3 miles per hour (6.9 km/h). The only known variant of this vehicle was the M84 mortar carrier, modified to carry a 4.2″ mortar pointing backward, and 88 rounds were stored. Removable roof plates were added to allow the mortar to be fired from inside the vehicle. The M84 had a crew of six but because of the mortar, the weigh rose to 47,100 lbs (21,400 kg). 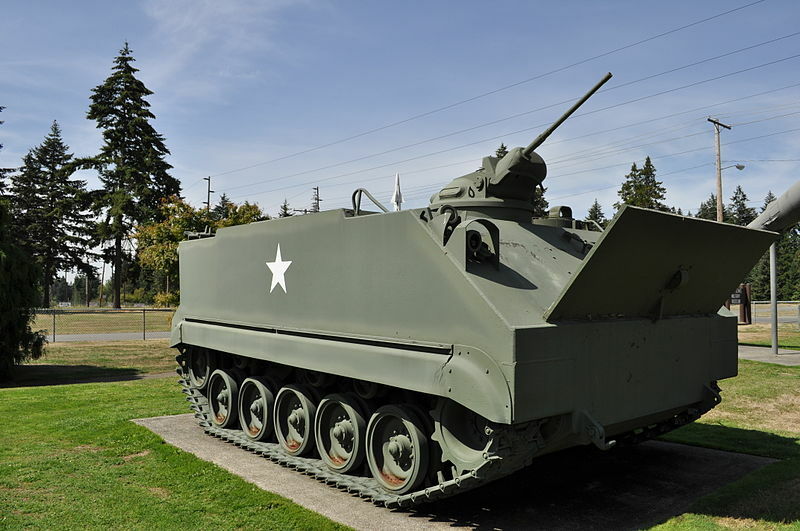 The M84 entered production in January 1957 and was replaced by the M106 Mortar Carrier, derived from the M113. The M59 entered service in spring of 1954, gradually replacing the M75 and was used by the US Army forces motorized infantry divisions until the late 1980s for some units like the national guard reserve, still retaining some for training purposes or exercises, and the mortar carrier variant M84. Their engagement in Korea is uncertain, or likely for testings, but the M59 was widely used during the Vietnam War, although quickly eclipsed by the M113. By the mid-1960s, it had been largely replaced already and was not without serious drawbacks. The first was its twin truck engine configuration, which was a cheap tradeoff, but was not well suited for the harsh conditions of military operations and this arrangement was deemed unreliable. The armor protection was also inferior to the M75, and it was much slower. The M59 was also exported to the following: Brazil (500 vehicles), Ethiopia (150), Greece (200), Lebanon (16) later turned to the Lebanese Arab army in 1976, Turkey (1550), South Vietnam (866), and Venezuela (15). The Brazilian and Venezuelan vehicles are now retired, but the status or fate of the others are unknown, possibly still frontline or reserve. The M113 was indeed a better proposition. Propulsion 2x GMC Model 302 six-cyl. petrol (combined 292 hp). M59 APC of the first serie, 1953. M59 “Decisive” preserved in Germany, as commandeered by Elvis Presley. M59 in sand livery, 1980s. Camouflaged M84 (the mortar carrier version) probably of the national guard reserve in the 1980s. Brazilian M59 with the trim vane erected, 1970s. Buddy of mine bought one from the Mexican army in the late 80’s for 14k, he ran a museum of sorts in Rochester, NY. The M59 had 2 transmissions, one for each engine. The 2 drive trains were completely separate.